Book right now to get this hot flight deal from Houston to Munich for April 2014. Travel with Thy Turkish Airlines for $812 round-trip and save on your Germany airfare over 35% compared to any other airline companies. Although the flight has a little bypass in Istanbul, layover time is not so long compared to how much you save by booking this one. Do not take any chances! Search for this cheap flight we have found on Travelgrove, but check other providers as well by comparing their prices and make sure you book the best offer. Check the screenshot for all the info you need. The flight leaves George Bush Intercontinental Airport on April 16 at 7:50 PM and arrives to Munich Airport 18 hours and 40 minutes later and it leaves Munich on April 26 at 7:30 AM for a 17 hours and 35 minutes return flight. You have to change planes in Istanbul each way, layover time is just 4 and 2 hours long respectively. 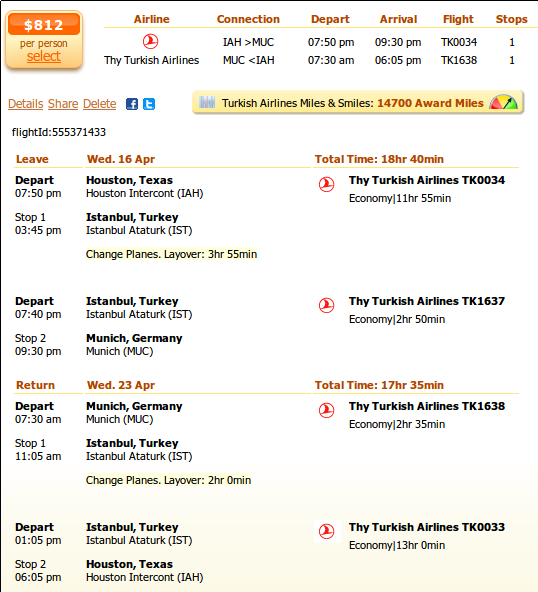 By purchasing this airfare you get 14,700 award miles from the Turkish Airlines Miles & Smiles frequent flyer program. This amount is nearly enough for a domestic flight within Europe and makes up about 17% of a free flight between Turkey and the US. Turkish Airlines allows you to take a 8 kg carry on baggage with you onto the plane, plus you can check in two more pieces of baggage (not larger than 158 cm each) for free. This entry was posted on Tuesday, February 18th, 2014 at 9:55 am and is filed under Airfare Deals. You can follow any responses to this entry through the RSS 2.0 feed. You can leave a response, or trackback from your own site.